Update: The post below is from 2012. 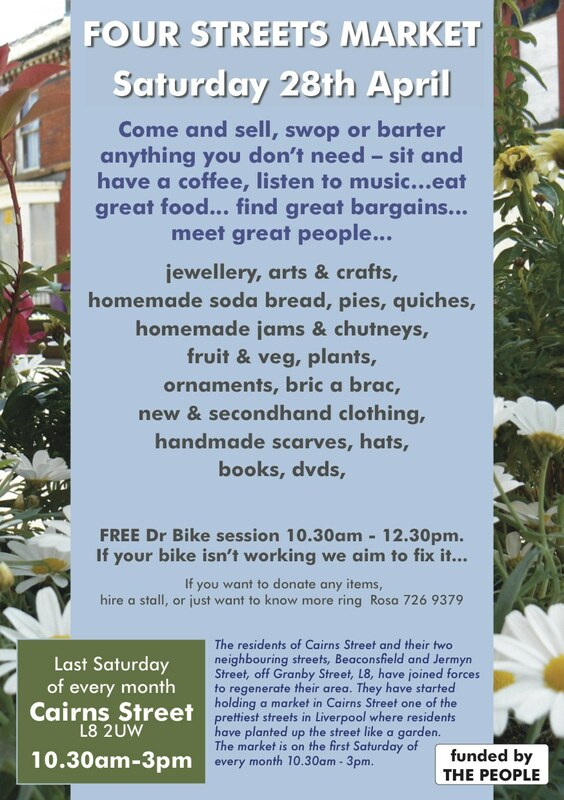 For this year, 2013, the Granby 4 Streets Market will be on the FIRST Saturday of each month from now to September. Saturdays 6th April, 4th May, 1st June, 6th July, 3rd August, 7th September. Saturday, 28th April 2012, Ronnie was in Granby. He explains why. As you might have read elsewhere on this blog, I regularly walk around Liverpool just to see how it’s doing. It’s my home and I care deeply about it. Well a couple of summers ago my walk brought me into Granby. An area of the city that I well knew was in trouble, and had been for ages. And they were having a street market. Of course! Against a backdrop of 130 empty and bricked up houses, the seventy or so people from the rest of the 200 houses in the area had decided to celebrate themselves and their place. It was a jaw-dropping moment for me. They’d recently ‘planted up’ their four streets. For the pleasure of gardening them, but also to repossess them from the sense of desolation seeping out of all those empty homes. And now here they were out in those streets, buying, selling and sitting around laughing and talking with each other and their visitors. By the following summer, 2011, we were working with these people on the future of their place. And we were at all of the street markets that year. As we will be this time around. And now the markets have begun again for this spring and summer. 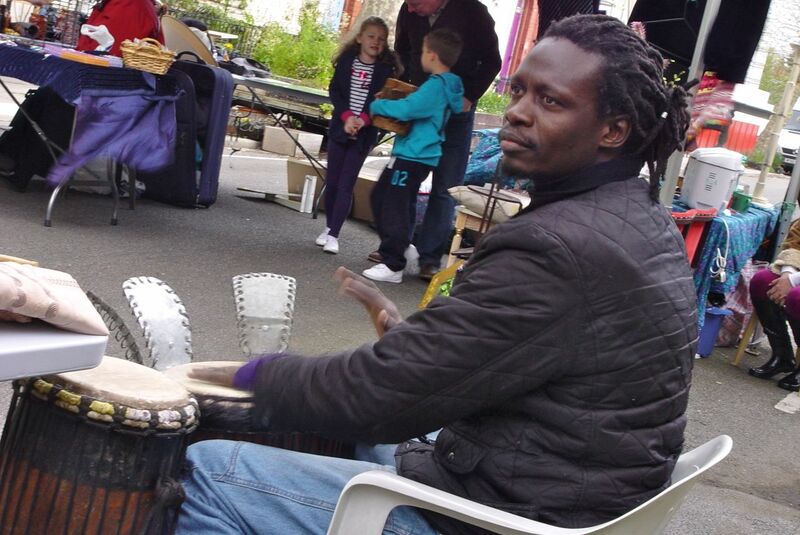 This Saturday, 28th April, the market took place from 10:00am to around 3:00pm, Cairns Street, Liverpool 8. Granby 4 Streets market, in Cairns Street, Liverpool 8. Well if you were there today I’m sure you’ll have had a lovely time. Attendance was good and people were saying how friendly it was. There was busking and drumming, the food was all delicious, the stalls were all interesting – and Dr. Bike was really popular with everyone. 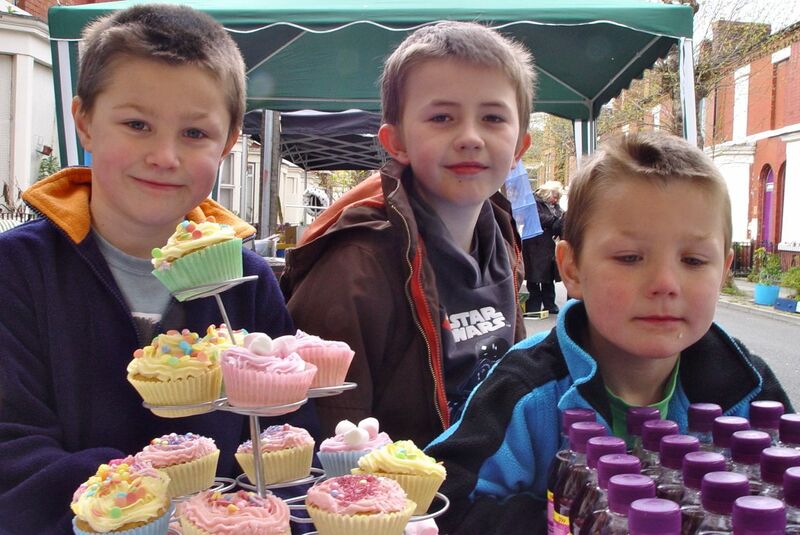 The stall was thought up by James, who’s six, as he thought cakes – made by themselves – and Vimto would be a winning combination. He was right, and all the money they made is being donated to charity! 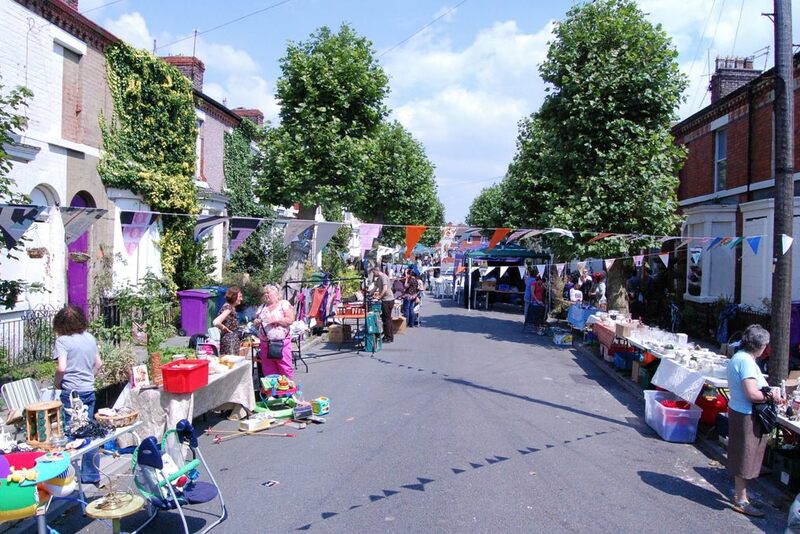 Next market : Saturday, 26th May 2012, from 10:30am to around 3:00pm, the Granby 4 Streets market, Cairns Street, Liverpool 8. 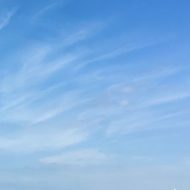 See pictures of it here. During summer 2012 work was supposed to at last begin on the renovation of the 4 Streets. It didn’t. …Markets by the people, of the people, for the people, shall not perish from a bit of rain here on Earth! Well said Joe. And good on you and everyone who’ll be putting these together all summer. By the people, of the people, for the people. Tom, Jack and James made my day, this is just what days like this are for. Many thanks to all who made our 1st market of the year a success… Btp-otp-ftp. And well done you Joe. And Theresa and Rosa and everyone else who organised and helped. Many thanks, Ronnie. Great photo of the 3 young apprentices! Thanks Ronnie for the nice page for the market and the Four Streets. Joe and all did a great job. Cheers Joe and everyone. Thanks Hazel, good to hear from you. Just as well we had the market yesterday isn’t it? Before this deluge began. There’ll be lots more Granby on here as we see what happens next.